These videos are of a talented young man named Tamer Tewfik whose group played several sets for the TONY AND SHLOMOH SHOW, a cable TV comedy-variety show which ran in the New York City area from 2004 through 2006. See below for info on Tamer and the show. Click the start button on the video you wish to watch. In I'll Take You For Good, Tamer is accompanied by Rhe Deville. Tamer (Piano/Vocals) earned his Bachelor of Music in Piano and a Masters of Arts in Teaching from The University of the Arts in Philadelphia, Pennsylvania. He pursued additional classical studies in Budapest, Hungary, studying harmony, solfege and conducting. As a vocalist, he has sung with the Choral Arts Society and Philadelphia Orchestra under the batons of conductors Riccardo Muti, Kurt Mazur, and Charles Dutoit. After teaching music in the Lower Merion School District for five years, Tamer established Swamp Queen Music through which he has recorded three CDs. Following the establishment of Swamp Queen Music, Tamer created THE JAZZ ASSEMBLY, a one-of-a-kind participatory experience for elementary through high school students. He performs these Assemblies in conjunction with Young Audiences of New Jersey; Young Audiences of Eastern PA; and Peter Nero and the Philadelphia Pops' Jazz in the Schools Series. Tamer's efforts with THE JAZZ ASSEMBLY are instrumental in bringing understanding and appreciation of jazz and standards to the next generation of music fans. As a jazz pianist Tamer has played with Les Paul; Grover Washington, Jr.; Stanley Clarke; Eddie Gomez; and Trudy Pitts. As a cabaret artist and pianist he has performed at the ASCAP Songwriters Showcase; Brandy's Saloon; Cleopatra's Needle; Cool Mood; Don't Tell Mama; The Duplex; the Iridium Jazz Club; Key West Piano Bar; NBC's Rainbow Room; Odette's; Raw Space Theatre; Sam's Cabaret; Tavern Camac; The Townhouse; the Triad Theater; and Upstairs @ Red. 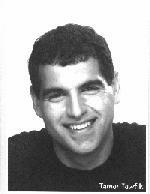 He served as musical director for Montauk Theatre Productions' Always,. Patsy Cline and The Show of the Century, in which he also performed. His original compositions have been heard in the theatrical productions Genesis; The Quiet Room, or What Happens When a Schizoid Ballerina Is Locked in a Room with a Duck~ As Heard In the Quiet Room, a cabaret based upon his work As Heard in The Quiet Room, ..., in which Tamer was the featured artist; and Seascape with Sharks and Dancer, for which his score received the SpotlightOn/Sage Award for Best Sound Design. Tamer's bio info was taken from the talent page at the website of Shlomoh's defunct cable show, THE TONY AND SHLOMOH SHOW. Rhe DeVille's bio can also be found at the above url.